A component that is used to process and execute Requests. This class is intended to be subclassed and methods overwritten to define the behavior for executing the different kinds of requests. Abstract methods must be overridden, but non-abstract methods all have meaningful default implementations. This method is called from process(ReadBranchRequest) when determining the maximum depth for the subgraph. Obtain the list of ChangeRequests that were successfully processed by this processor. The execution context that this process is operating within. Get the 'current time' for this processor, which is usually a constant during its lifetime. Get the name of the source against which this processor is executing. This method is called from process(ReadBranchRequest) when determining whether particular nodes should be included in subgraph reads. Take any of the changes that have been accumulated by this processor and notify the observer. Process a request to collect garbage. 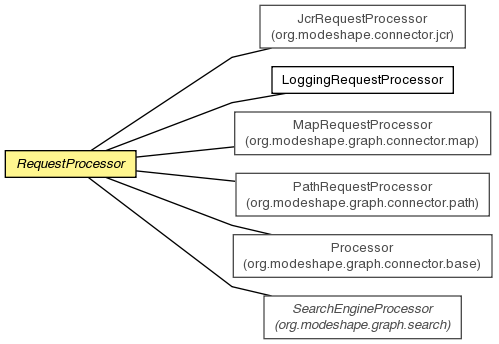 Method that is called by process(Request) when the request was found to be of a request type that is not known by this processor. Record the supplied change request for publishing through the event mechanism. Set the supplied request to have the default cache policy and the current time in UTC. Set the supplied request to have the supplied cache policy and the current time in UTC. Method that is called by process(Request) when the request was found to be of a request type that is not known by this processor. By default this method sets an unsupported request error on the request. This method is called from process(ReadBranchRequest) when determining the maximum depth for the subgraph. By default, this method returns Integer.MAX_VALUE, signaling that the ReadBranchRequest's maximum depth should be honored. However, subclasses can override this method to return a constant value that will be used if less than the ReadBranchRequest's maximum depth. This method is called from process(ReadBranchRequest) when determining whether particular nodes should be included in subgraph reads. For example, some processor implementations might want to always exclude nodes with certain names from all subgraph reads. If this is the case, subclasses should override this method (which always returns true), and determine whether the node at the supplied location should be included in the subgraph. The default implementation applies the function. Note that this list is modified during processing and thus should only be accessed by the caller when this processor has been closed. Also, if this processor encounters errors while processing change requests, the processor does not throw out any of the changes. Thus it is up to the caller to decide whether any of the changes are to be kept. the list of successful changes; never null but possibly empty. Take any of the changes that have been accumulated by this processor and notify the observer. This should only be called after close() has been called.